Jdaking's SMM Menu Replacer for Basement Living (ESP) Recommend pack loose files into BAS/BA2 for better performance espcially on SDD drive. 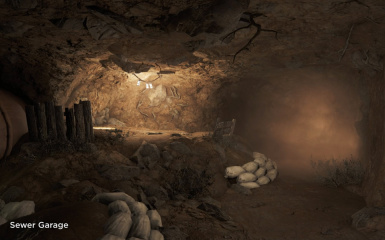 Basement workshops are now linked to the parent settlement they're created in. Must scrap door and re-build if you have an existing basement. Get your items out of the basement workshop first of you'll lose them! 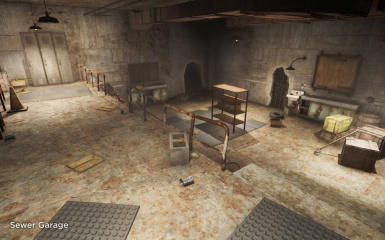 Can now build basement doors inside interiors like Home Plate or other player homes with workshops! Fixed problem where saving caused basement doors to stop working! 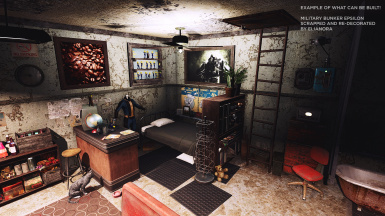 Made default bunk beds in the Fallout Shelter able to be slept on. Enabled Fast Travel from inside all locations to workaround bug where door stops working. Permanent fix incoming. This mod will be coming to XBOX soon! 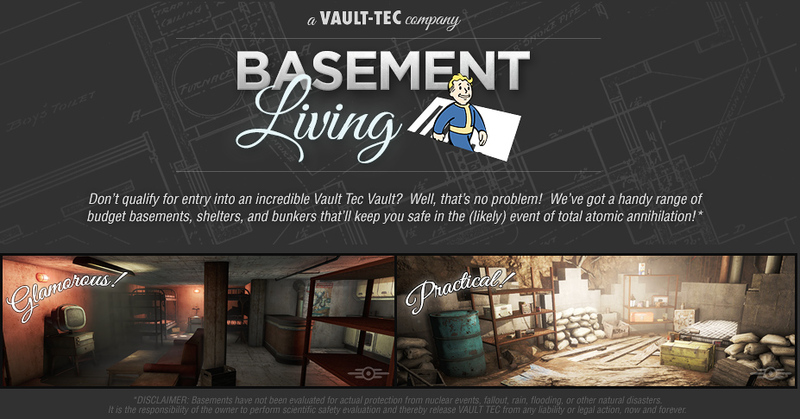 If you see any version of this on Bethesda.net before then, it was stolen, and I cannot guarantee its quality or safety for your game/saves. Thank you for your patience and support! VERSION 1.3 REQUIRES A CLEAN SAVE OR A NEW GAME SO BE CAREFUL! PLEASE SEE CHANGELOG OR STICKY POST FOR VERSION DETAILS! 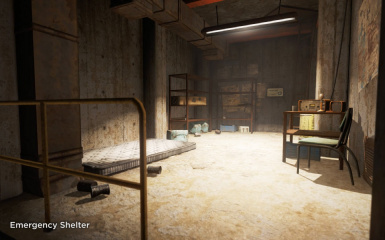 CHECK OUT THE AWESOME INTERIORS PEOPLE ARE MAKING IN THE USER IMAGES SECTION! If you'd like the basements to be require finding Picket Fences magazines instead of immediately available to the player, check out Greslin's patch here! Ever wanted to take a break from the outside world, have a pause from the weather (and settlers?) 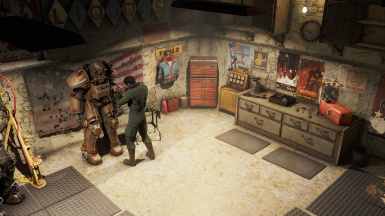 Ever wanted to store your weapons, Power Armor, and other items in a secure space where they will be left alone? Look no further. 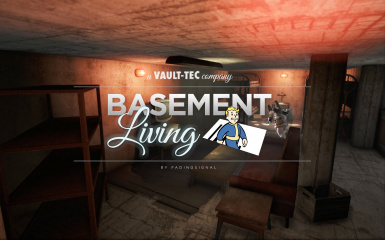 Basement Living adds 10 completely standalone basements & bunkers (interior cells) each with their own standalone workshops and craftable door hatches, allowing you to place/enter into them from any settlement you choose. They work just like Home Plate, so you can tear-down and decorate them however you like! 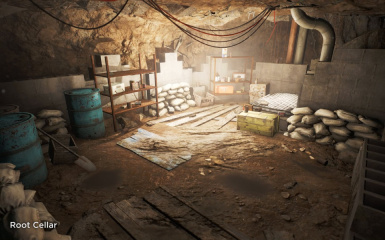 This was done carefully, and methodically, and does not alter ANY existing settlements or interiors whatsoever, nor does it require any batch files, god mode, or other workarounds. They're mostly copies of vanilla cells, so you may recognize a few. I found a couple cool unused cells and copied those too, adding a few things and lighting touches. NO BATCH FILES. NO GOD MODE. NO RE-ASSIGNED SETTLEMENTS. FULLY STANDALONE. PLEASE WATCH THIS VIDEO TO SEE HOW IT WORKS! LET'S SEE WHAT YOU CAN BUILD IN THESE SPACES! UPLOAD/SHARE IMAGES! 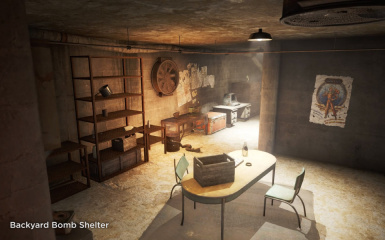 These are real interior cells you will 'zone' into, just like vanilla interiors, which makes them a safe place from enemies, weather, and settlers when you feel the need to get away. They act just like a player home. 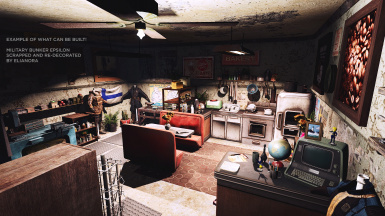 There is a lot of stuff by default to scrap in each location to get you started, and it's easy to just climb up the hatch and grab materials from your main Settlement Workshop if you need more. This uses vanilla keywords, and as such is fully compatible with Settlement Keywords. Hatches to "teleport" to the basements are under the Special category. I may change where they are in the menu if there is enough feedback, or require Blueprints in your inventory to keep it clean. Under Special you will find 10 new basement hatches, one for each unique basement. 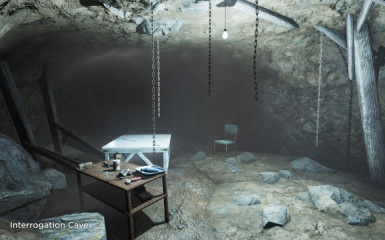 They require 10 metal, 10 wood, 10 concrete, to give the effect of "crafting" the basement, even though you're just crafting a "teleport" door to get in. Place a hatch anywhere on the ground of your Settlement. I like to place these behind the house, or in a settlement bedroom. Open it up like any door, and you're now in the interior basement cell! 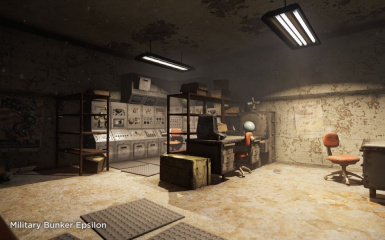 Enter into Workshop Mode to scrap the interior, and begin decorating it how you like! Only one door to each basement can exist at a given time, so if you craft a second door to the same exact basement, the old one will just move to your location, and you will be notified where it moved from. See video for details. 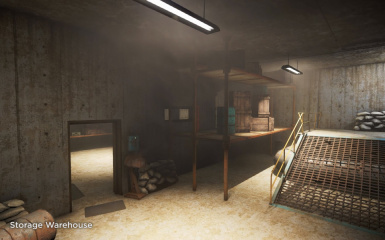 The interior cell will remain 100% the same as you left it, so you can move the entrance doors around to any settlements with no issues or effects to the interiors. Q: Does this cause cell reset bug? A: Nope! These are interior cells. This mod does not edit any worldspace cells. Anything that can be scrapped is a unique object as to not enable scrapping of thsoe same items above-ground. 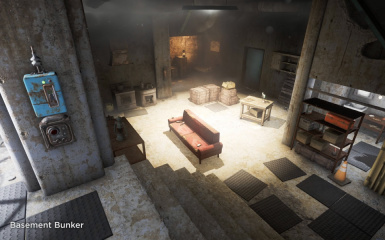 Q: Will anything respawn in the interiors? A: They are flagged to never respawn, but be safe and make backups of your saves! Q: Can they link/share to the settlement workshop they're placed in? A: As of v1.2.1 this is now how it works! It will now automatically link to the parent settlement container. Unfortunately, because these cells are different "locations", the provisioner link does not persist, so you will only get the parent workshop container's items, not everything that is shared between settlements. Still looking into ways to address this, but right now it would require doing some major overhaul to the Workshop code and that's not worth it. This is still a nice upgrade. A: These basements are ACTUAL full interior cells, like any building/dungeon in the game and cannot be duplicated at runtime. This means they always "exist" and a door is crafted as just a way to teleport into them, if that makes sense. Also, crafting multiple doors that lead to the same cell was not only cheaty (teleportation across the map, anyone?) but could also lead to strange situations where the return destination could be overwritten and cause you to appear where you didn't expect. When you create a second door for the same basement, it will automatically move the old one and notify you (i.e. 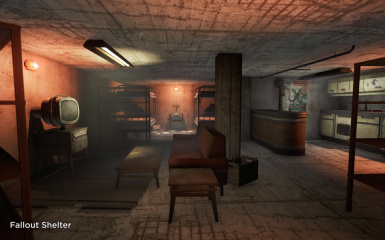 basement was moved from Red Rocket) so only one will exist per-basement. Again, this is covered in depth in the video. 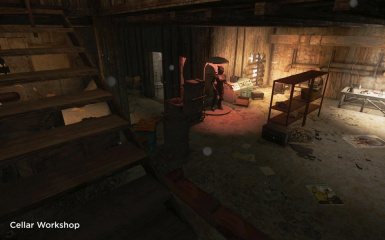 Lastly, making unique copies of each basement for each settlement would yield 300 cells, which is more than the entire game and is simply not manageable. I've been using this for a while, and 10 feels pretty good, since it's easy to re-locate at will. I'm only using 2 right now since I placed them at my primary Settlements where I tend to spend most of my time. One I used as a secluded home, the other I use as a storage / armory.